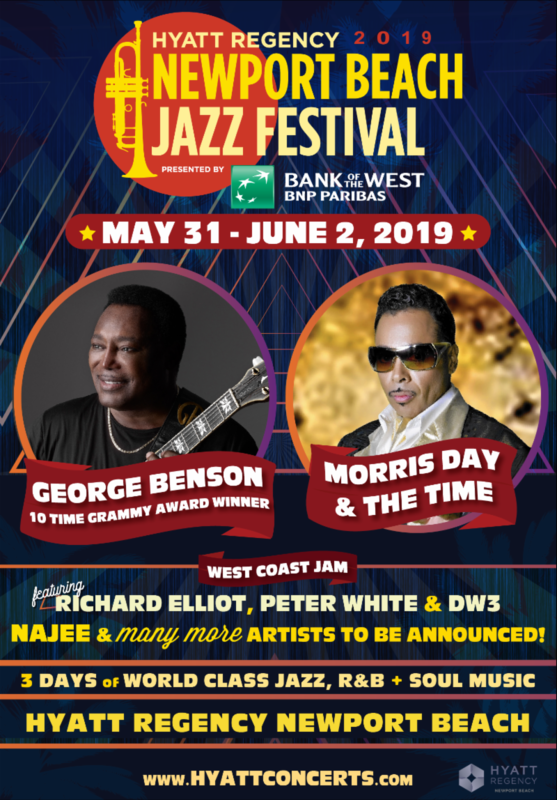 The Newport Beach Jazz Festival returns to the Hyatt Regency Newport Beach the weekend of May 31 – June 2, 2019! Join us for the three days of world-class jazz, funk and R&B music, presented by Bank of the West! Get your Weekend Passes now! and get ready to join us for a weekend of music, dancing and fun in the sun! 10-Time Grammy Award winning guitarist, George Benson, has used his jazz roots as the foundation for an engaging mix of pop, R&B and other shades that add up to a style that appeals to a broad mainstream audience. Along the way, he has also established himself as a formidable jazz singer – one whose biggest career hits have showcased his vocals as well as his guitar chops. In short, this guitar legend is the complete package. Three of smooth jazz biggest stars with roots in the California jazz scene, “West Coast Jam” is the brainchild of Richard Elliot who has created a thrilling summer tour with his friends Peter White and the hottest party band in smooth jazz, DW3, backed by an additional horn section. This Grammy nominated saxophonist and flautist has made a career following his heart and keen musical intuition by pushing musical boundaries. He has made his name by fusing the music closest to his heart – R&B and Jazz. Book Your Room for Festival Weekend! Room reservations are now open for festival weekend! Treat yourself to an ultimate experience at the iconic Hyatt Regency resort and enjoy special perks as a hotel guest, including early entry into the venue, express beverage lines and complimentary waters – plus, end the evening just steps from your room! or call 800-233-1234 and mention Jazz Festival! For more details, visit www.festivals.hyattconcerts.com.